Walk with this book to find some of the unexpected places where poetry can flourish. Discover poetry growing "where it can," in the infinite and in the microscopic: in the "star-gazing, star-thinking, star-dreaming...Milky Way," and "in minute invisible architectures...of snowflake sculpture reality;" in mountain passes where "gold leaves spill and spin like doubloons," and in the grizzly, "hunger-hearted and ugly, a horrible beauty, / a hairy breath of berry-laced and blood-hot red, / hunter and hunted, and hated;" in the city where "birds...survive to sing about sun- / light straining through the gritty breath / of New York," and in wilderness that has "no nakedness," that is "lovely because it is empty." The poems in this anthology first appeared in The Amicus Journal, the quarterly publication of the Natural Resources Defense Council (NRDC). Selected by the journal’s poetry editor, Brian Swann, they represent a broad array of responses to the natural world—from warning to celebration—by some of the nation’s most distinguished poets. Included is work by American poets Wendell Berry, Michael Dorris, Denise Levertov, Mary Oliver, Pattiann Rogers, and William Stafford, as well as work from poets in Australia and Mexico. All grapple with issues of nature and the environment from the perspective of the final decade of the millennium. These poems remind us that we can be dazzled both by nature and by the poetry that explores the natural world. Brian Swann is professor of English at The Cooper Union for the Advancement of Science and Art. In addition to his scholarly work on Native American literature, he is the author of numerous volumes of poetry, fiction, and books for children. His recent publications include Wearing the Morning Star: Versions of Native American Song-poems and Turtle and the Race Around the Lake. "I hope this collection reminds many readers, including some who may not regularly read The Amicus Journal, of the vitality and interest of the poems that Brian Swann has been publishing in that magazine for years.... Metaphor is rooted in the living world, and the one subject is life itself, all of it." 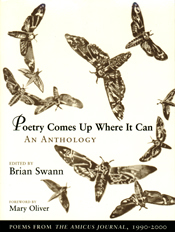 "Swann's able editorial touch is evident, and makes this anthology more than simply a collection of good eco-poetry. Contributors' notes at the end are incisive, witty, and informative.... The poems in this selection inspire as well as teach.... this is a book that should be bought and read." "You can dip in anywhere and come face-to-face with a clear-eyed, accessible, and luminous encounter in the realm of nature.... This book will serve as your friend for the backyard, the study, the city, or the forest."